Synopsis:Sarah valiantly struggles with waking up in the morning, being productive, and dealing with social situations. Sarah’s Scribbles is the comic strip that follows her life, finding humor in living as an adulting introvert that is at times weird, awkward, and embarrassing. I love small, quirky books filled with self irony and truth. I also love cats. Putting the two together in a series of ironic cartoons is not a mistake. This book was a blast from the first page (I mean the cover) to the end. Sarah’s drawings are insightful and fun without becoming cliché, they make you laugh and they make you think. And to be quite honest, as an aspiring crazy cat lady, I recognized myself in a lot of the fun scenarios the book puts forward. As much as I though enjoyed the book, I will have to point out that it did have a lack of cat related topics and the comics did not have a clear topical connection. This did though not take away from my enjoyment of the comics, but as a book it would have felt more as a “book” if there were some interconnection between the comics. That aside, if you want to read some quirky comics about adulting or not adulting, you will certainly enjoy this book. 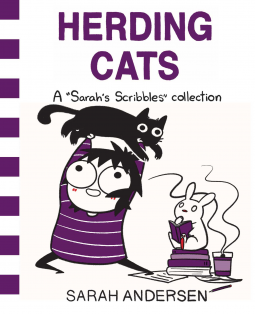 This entry was posted in Book Reviews, Comic & Graphic Novels and tagged adulting, Andrews McMeel Publishing, book review, book reviews, bunnies, cats, Comics & Graphic Novels, Herding Cats, Humor, not adulting, not cats, Sarah Andersen, Sarah's Scribbles. Bookmark the permalink.